Gadi Eisenkot was born on May 19, 1960, in Tiberias. He is the second of four children born to Meir and Esther Eizenkot, Jewish Moroccan immigrants. Eizenkot grew up in the southern port city of Eilat, and studied at Goldwater High School, majoring in maritime studies. He received a B.A. in history from Tel Aviv University and attended the United States Army War College for a master's degree. After being drafted to the Israel Defense Forces, he entered the Israeli Air Force’s pilot course, but was dropped from it after one month and joined the Golani Brigade and became its commander in 1997–98. 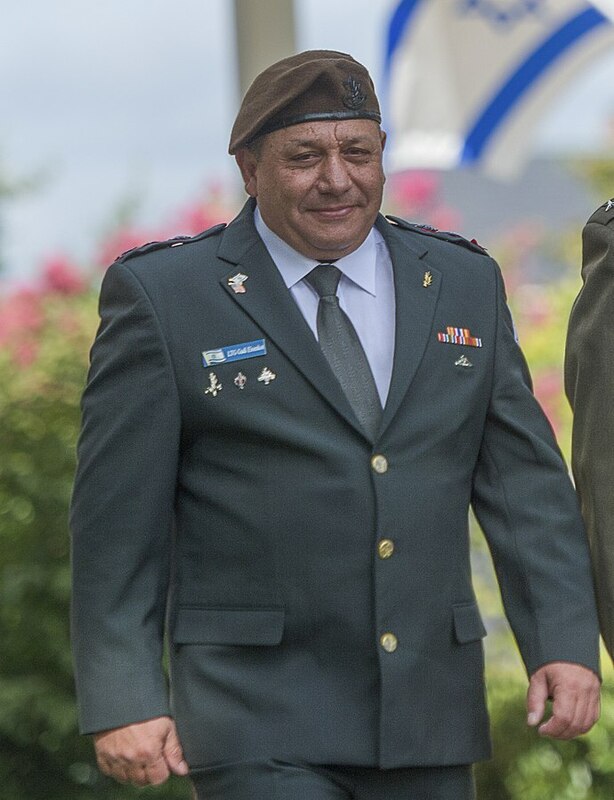 In 1999, Eizenkot was selected to be the Military Secretary for the Prime Minister and the Minister of Defense under Prime Minister Ehud Barak. Since then he has commanded the 366th Division and the Judea and Samaria Division. He was promoted to head of Israeli Operations Directorate in June 2005. A year later, Eizenkot became head of the Northern Command. In 2011, Eizenkot went to study for a post-graduate degree at Haifa University in political science. In 2013, he served as Deputy Chief of General Staff and he was promoted to Chief of Staff in 2015. Upon taking office he began to promote measures to strengthen the ground forces. He authored a multi-year plan to build up the IDF to prepare for a range of threats. Eizenkot believes that the ultimate test of military action is the ability to sustain long periods of peace and safety to allow the state to develop. That objective is accomplished through deterrence achieved through military strength and the use of force. If force is needed, he believes the goal should be to end the conflict in the shortest time. During his tenure, he escalated the “War Between Wars,” covert operations against Israel’s enemies. It was only after his retirement that some of the actions he authorized in Syria were revealed. After an upsurge of Hamas-directed violence from Gaza, some of which was an outgrowth of the “Great March of Return,” Eisenkot was criticized by Defense Minister Avigdor Lieberman and other members of the government for not responding more harshly. Eisenkot favored a more moderate approach and the pursuit of a ceasefires. He also believed the IDF needed to remain focused on what he considered the more serious threat from Hezbollah. Eisenkot was also given credit by some, and criticized by others, for doing more to integrate women in the IDF than his predecessors. For example, the Armored Corps received its first four female tank commanders, the Navy announced that the first female naval combat soldiers will serve on the new missile ships, the first woman was appointed to command an Israel Air Force squadron and another to command transport planes. He did, however, oppose allowing women to serve on the frontlines. Eisenkot also provoked criticism from many Israelis when he supported the trial of an IDF soldier, Elor Azaria, who was ultimately convicted of manslaughter in 2017 for the shooting of a neutralized and unarmed terrorist in Hebron. Eisenkot appointed a panel of ex-officers to review Brick’s report and independently investigate the ombudsman’s claims. They released a new report at the end of December 2018 that disputed Brick’s conclusion and concluded the IDF was prepared for a new ground war. In January 2019, Eisenkot retired after 40 years of service and was expected to enter into politics. Eisenkot is married and the father of five children. He currently resides in Herzliya. Yaakov Katz and Anna Ahronheim, “Outgoing IDF Chief of Staff Gadi Eisenkot - A look back,” Jerusalem Post, (January 11, 2019).